Mainland Chinese or Mainlanders are Chinese people who live in a region considered a "mainland". It is frequently used in the context of areas ruled by the People's Republic of China, referring to people from mainland China as opposed to other areas controlled by the state such as Hong Kong or Macau. The word is also often used by Taiwan people to distinguish the Chinese from Mainland China from themselves, if not calling the mainlanders and themselves as Chinese and Taiwanese directly respectively. Ma Ying-jeou, the former President of the Republic of China (Taiwan). 1949 immigrants or Waishengren (Chinese: 外省人; pinyin: wàishěngrén; literally: 'extraprovincial person') are people who moved to Taiwan from mainland China after 1945 until the late 40s and early 50s. This group also includes all of their descendants born in Taiwan. Daluren (大陸人; dàlùrén; 'mainland people') are residents of mainland China, especially citizens of the People's Republic of China (PRC) who live in mainland China. In the context of demographics of Taiwan, the term mainlander when applied to a Taiwan resident most likely refers to daluren. The translations of waishengren (Chinese: 外省人; pinyin: wàishěngrén; Pe̍h-ōe-jī: gōa-séng-lâng) and benshengren (本省人; běnshěngrén; pún-séng-lâng) into English poses some interesting difficulties. The usual English translation of waishengren is Mainlander, although many waishengren find this translation uncomfortable since it implies that waishengren are residents of mainland China, when they are all residents of Taiwan. Benshengren, which literally translates to "this province's person" and is sometimes translated as "native Taiwanese", refers to the people native to Taiwan before the Republic of China took over rule of Taiwan in 1945 and the mass exodus of mainlanders following the Chinese Civil War, but this translation could be confused with the indigenous Austronesian people. Most academic literature uses the terms waishengren and benshengren directly. The terms rarely come up in the English-speaking media. Many supporters of Taiwan independence object to the term "extra-provincial people", because it implies that Taiwan is a province of China, and prefer the name Taiwanese new immigrant [zh], (新住民; Pe̍h-ōe-jī: sin-chū-bîn). The latter phrase has not become popular in Taiwan and is extremely unpopular among waishengren themselves. Chinese Civil War veterans especially are called "old taro" (老芋仔; lāu-ō·-á) in Taiwanese Hokkien, due to the similarity between the shape of mainland China and taro leaves), or waisheng laobing (Chinese: 外省老兵; literally: 'external-province veteran', in Mandarin. In government publications and the media, they are also called "honorable citizens" (榮民; róngmín; êng-bîn). Mainlanders make up about 10% of the population of Taiwan and are heavily concentrated in northern Taiwan especially in the Taipei area. Although no longer dominating the government, waishengren still make up a large fraction of bureaucrats and military officers. The formal definition of a mainlander is someone living in Taiwan whose "native province" is not Taiwan. Native province does not mean the province in which one is born, but rather the province where one's father's "ancestral home" is. Until 1996, identity cards and passports in Taiwan contained an entry for native province. The removal of native province from identity cards and replacement with place of birth was motivated in large part to reduce the mainlander/local distinction. This is especially true given that virtually all "mainlanders" born after 1949 were born in Taiwan, not in their "native provinces". Because of the "native province" definition, someone who is born on Taiwan, but whose father's family roots are not in Taiwan, is generally considered a waishengren. By contrast, someone who is not born in Taiwan, but whose native province is Taiwan (most notably Lien Chan) is generally not considered a waishengren. Similarly, a child that is born to a Taiwanese businessman residing in the PRC would generally not be considered a waishengren. Furthermore, recent immigrants to Taiwan from Mainland China, mostly from marriages and undocumented migrants, are not considered waishengren, but make up a separate social category. Although the numbers of these people are thought of as small and insignificant by most Taiwanese, it has been pointed out that recent immigrants from Mainland China and their children actually make up a larger population in Taiwan than Taiwanese aborigines. The distinctions get even fuzzier with mixed marriages and the fact that provincial identity sometimes does not correlate in obvious ways to characteristics such as political orientation or ability to speak Taiwanese. For example, although Mainlanders are often stereotyped as supporting Chinese reunification and opposing Taiwan independence, there are numerous examples where this formula does not hold. Similarly, it is common to find younger waishengren who speak fluent Taiwanese and younger benshengren who cannot speak it at all. The number of the original waishengren generation who migrated to Taiwan sixty years ago has been dwindling as they age and die. Thus, the great majority of today's waishengren are their descendants born in Taiwan, and they do not speak the dialect of their "native province". Waishengren are descended from the people who followed Chiang Kai-shek to Taiwan after the Kuomintang lost the Chinese Civil War in 1949. These people included Kuomintang officials, soldiers, merchants, bankers, executives, scientists, intellectuals, refugees, and anyone else who feared Communist rule. Until the 1970s, these people controlled the political systems of Taiwan; this, along with the looting and corruption that occurred under Chen Yi's military government immediately following the Japanese surrender in 1945, generated resentment among benshengren and was one of the main causes of the Taiwan independence movement. Starting in the 1970s, Chinese nationalist dominance of the government began to recede. This was due to a lack of a political or social theory that would justify continued Chinese nationalist dominance, meritocratic policies which allowed local Taiwanese to move up in the political establishment, and economic prosperity which allowed for social mobility for those outside of the political establishment. Intermarriage and a new generation raised under the same environment has largely blurred the distinction between waishengren and benshengren. In the late 1990s, the concept of "the New Taiwanese" became popular both among supporters of Taiwan independence and Chinese reunification in order to advocate a more tolerant proposition that waishengren, who sided with the Allies against the reluctant Japanese colony in Taiwan during World War II, are no less Taiwanese than benshengren. However it quickly became apparent that the notion of New Taiwanese meant different things to supporters of independence and unification. To supporters of independence, the concept of New Taiwanese implied that waishengren should assimilate into a Taiwanese identity which was separate from the Chinese one. By contrast, the supporters of Chinese reunification seemed to believe that all Taiwanese (not just waishengren) should restore a previously marginalized Taiwanese identity without antagonizing a larger pan-Chinese identity. As of the early 21st century, more and more waishengren see themselves as Taiwanese and as socially distinct from current residents of Mainland China. Unlike those belonging to groups such as the Hakka or Taiwanese aboriginals, waishengren are not encouraged to find their root, and their relationship with anti-China organizations suffers further as a result. Most of them, especially those of the younger generation, make extensive efforts to establish themselves as Taiwanese, sometimes by manifesting good interest in Hoklo Taiwanese culture. At the same time, right-wing discourse alleging that pro-unification waishengren are a fifth column for the PRC agonizes those mainlanders who regard Taiwan as their new homeland. Now, the term "mainlander" is used to describe a person, Chinese by race, born and raised in mainland China, thereby avoiding confusion with waishengren. Lien Chan has been sometimes denoted a waishengren, often by his political opponents, although the general perception on Taiwan is that he is not. Although he was born in mainland China and his mother was of mainland ancestry, his father's ancestral home was in Tainan, Taiwan. Since the mid-1990s, there has been a small amount of mainland Chinese immigration into Taiwan. These immigrants are predominantly female and are often colloquially known as dàlù mèi (大陸妹), which means "mainland girls" (literally: mainland sister). These consist of two categories: female brides of businessmen who work in the mainland; and women who have married rural Taiwanese, mainly through a marriage broker. This population is distinct from waishengren. 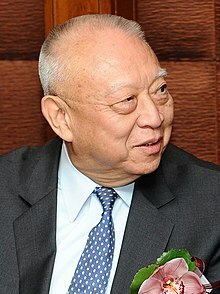 Tung Chee Hwa, former Chief Executive of Hong Kong. In Hong Kong and Macau, "mainlander" (also "inlander"[dubious – discuss]) refers to residents of mainland China, or recent immigrants from mainland China. Residents of mainland China are usually referred to as 大陸人 (jyutping: daai6 luk6 jan4, literally "mainlanders"), 內地人 (jyutping: noi6 dei6 jan4, literally "people from the inland"). Officials in China, as well as a few leftist institutions in Hong Kong, refer to themselves as 內地同胞 (jyutping: noi6 dei6 tung4 baau1, literally "inland compatriot"). The second term is neutral, and the first term is commonly used by local Hong Kong Chinese but also used by government issued statements to refer to people from mainland China. Mainlanders are sometimes called 表叔 (jyutping: biu2 suk1, literally "father's male cousin"), 表姐 (jyutping: biu2 ze2, literally "female cousin"), and 阿燦 (jyutping: aa3 chaan3), which were coined by various characters in movies and television series. These terms are considered derogatory and are politically incorrect. Recent immigrants are more politically correctly called 新移民 (jyutping: san1 ji4 man4, literally "new immigrants"). 阿燦 is especially rude. At the time when Hong Kong was colonised by Great Britain, the colony first covered only Hong Kong Island, with a population of only around 6,000, most of whom were fishermen. Other than the indigenous population on Hong Kong Island, Kowloon and New Territories who had lived in the area before the British arrived, most people in Hong Kong either immigrated from somewhere in mainland China, or were descendants of those immigrants. The largest influx of population from the mainland was during the Taiping Rebellion (late 19th century) and the Chinese Civil War (1945–1949). The British colonial government maintained a touch-base policy until the early 1980s, allowing people from Mainland China to apply to be Hong Kong residents if they manage to arrive in the territory. Some of these early immigrants, especially those who moved from Shanghai in the 1940s and early 1950s to escape the Communist government, some came to dominate the business world in Hong Kong. In the 1980s and 1990s, Shanghai-born immigrants also occupied some of the prominent roles in the government, including former Chief Executive Tung Chee-hwa and former Chief Secretary Anson Chan. After decades of wars, internal conflicts and the Cultural Revolution, there was a large gap in the level of development between Hong Kong and the mainland. Many new immigrants arriving in the late 1970s and early 1980s were thought to be less sophisticated, and preserved many habits from the rural way of living. A very popular TVB series in 1979, 網中人, "the Good, the Bad, and the Ugly", starring Chow Yun Fat as a good-hearted and handsome Hong Kong university graduate, Carol "Dodo" Cheng as a rich and charismatic HK-and-UK-educated university graduate, and Liu Wai Hung (廖偉雄) as 阿燦 (jyutping: aa3 chaan3), Chow's long-lost good-hearted but unsophisticated rural-bred mainland brother arriving in Hong Kong as a new immigrant. Starting from the early 1990s many new immigrants to Hong Kong are the spouses of residents and their children. Many of them are not rich, and some have to rely on money from Comprehensive Social Security Assistance to survive. Although only a few do so, new immigrants of this time were held in a negative view. Since the Handover in 1997, academic exchanges between Hong Kong and Mainland China have become much more common. In 2004, a policy was passed that allowed mainland high school students to apply to Hong Kong universities. The Chinese government encouraged more Hong Kong students to study in mainland universities by offering scholarships. Since 1 July 1997, the day when Hong Kong became a Special Administrative Region of the People's Republic of China, the immigration policies have changed. It is stated that "[a] person of Chinese nationality born outside Hong Kong before or after the establishment of the HKSAR [Hong Kong Special Administrative Region] to a parent who, at the time of birth of that person, was a Chinese citizen who is a permanent resident, is a permanent resident of the HKSAR and enjoys the right of abode in Hong Kong". But in 1999, the Supreme Court of the HKSAR made a judgment that as long as the person is born in Hong Kong, they will be regarded as a permanent resident and will get the right of abode, even though their parents are not permanent residents of Hong Kong at the time they are born. Since then, a lot of Mainlanders have come to live in Hong Kong. Every day there is a quota of 150 immigrants. A daily sub-quota of 60 is given to children of all ages who are eligible for the right of abode in Hong Kong. A sub-quota of 30 is for long-separated spouses. those entering Hong Kong for the inheritance of property. In 2003, the mainland authorities loosened control on mainland residents over visiting Hong Kong and Macau. Before this change, residents from the mainland could only visit Hong Kong and Macau for sightseeing as part of tour groups. The Individual Visit Scheme allows mainland residents of selected cities to visit Hong Kong and Macau for sightseeing on their own. It has boosted tourism in the two special administrative regions. On 28 June 2006, the HKSAR imposed the Quality Migrant Admission Scheme. It is a scheme which aims at attracting highly skilled or talented persons who are fresh immigrants not having the right to enter and remain in Hong Kong to settle in Hong Kong in order to enhance Hong Kong's economic competitiveness in the global market. Successful applicants are not required to secure an offer of local employment before their entry to Hong Kong for settlement. Many Mainland artists and former national sportsmen/sportswomen have applied for the right of abode via this way, such as Li Yundi and Lang Lang. The following are some notable people who were born in the mainland and moved to Hong Kong. Anson Chan, politician, born in Shanghai. Wong Jim (aka. James Wong), musician, born in Guangdong. Lau Chin Shek, politician, born in Guangdong. Tang Hsiang Chien, businessman, born in Shanghai. Tung Chee Hwa, politician, born in Shanghai. Wong Kar-wai, filmmaker, born in Shanghai. ^ "Hong Kong 2006 - Population and Immigration". Yearbook.gov.hk. Retrieved 2013-10-19. Ku, A. 2001. “Hegemonic Construction, Negotiation, and Displacement: The Struggle over Right of Abode in Hong Kong.” International Journal of Cultural Studies, no.4(3): 259-278. Kuah, K.E. ; and Wong, S.L. 2001. “Dialect and Territory-Based Associations: Cultural and Identity Brokers in Hong Kong.” in P.T. Lee (eds). Hong Kong Reintegrating with China:P, Cultural and Social Dimensions. Hong Kong: Hong Kong University Press. Siu, Y.M. 1996. “Population and Immigration.” in M.K. Nyaw and S.M. Li (eds.) The Other Hong Kong Report 1996. Hong Kong: The Chinese University Press. pp. 326–347. So, A.Y. 2002. Social Relations between Pearl River Delta and Hong Kong : A Study of Cross-border Families. Hong Kong: Centre for China Urban and Regional Studies, Hong Kong Baptist University. Tang, H.H. 2002. New Arrival Students in Hong Kong: Adaptation and School Performance. M.Phil thesis, Department of Sociology, University of Hong Kong. Tzeng, Shih-jung, 2009. From Honto Jin to Bensheng Ren- the Origin and Development of the Taiwanese National Consciousness, University Press of America. ISBN 0-7618-4471-6.